Yesterday marked exactly one week until Christmas and we are in the midst of Hanukkah. Many of us are busily getting ready for or already enjoying the holidays which seem to sneak up on us each year. This time of year is full of holiday traditions that have been either passed down from generation to generation or that we have started for ourselves. While some of my family and friends spend hours in the kitchen making goodies or are watching countless holiday specials, I prefer to spend my time making garlands for their mantles, wreaths and swags for countless doors and stringing popcorn and cranberries for the tree. I learned how to make garland many years ago when I was asked to help decorate Edson Hill Manor in Stowe. It was a rather daunting task to make all of the garlands for the hotel, but I quickly got the hang of it and it has been my holiday tradition ever since. I always have people asking me how I make garland and if I can show them. So I decided that making garland, wreaths and swags would be a great topic for the blog this month. So here goes! First you should decide just how long you wish to make the garland and where it is going to be displayed. For my mantel I typically make a 6 foot length which sits nicely on the top with no overhang. Once your length is determined cut the twine to this measurement. Next you will need to prepare your greens. I often use a variety of textures for added interest, such as balsam, white pine, boxwood, cedar or juniper. Where can I find these you might ask? If tramping through the woods or garden this time of year to cut your own doesn’t sound appealing, you can often purchase cut greens at garden centers or tree lots. This is a great use for the excess branches from the Christmas tree as well. Once you have decided what you would like to use for greens, cut them into 6 to 10 inch pieces. Lay the twine out on a flat surface. It is now time to start adding your greens. To do this, make a small bundle of several pieces. 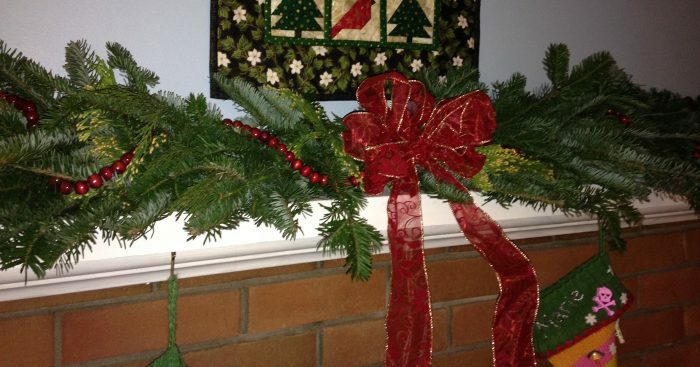 For a mixed evergreen garland, I typically use 1-2 pieces of balsam, 1 piece of pine & 1 piece of cedar or box wood. If you are making your garland out of one type of evergreen, use 3-4 pieces for a nice full look. Place your little bundle of greens on the end of the twine so that the stems are pointed toward the remaining length twine. Take your spool of wire and tie the evergreen bundle to the twine. Wrap the stems as tightly as you can so that they are secured to the twine. DO NOT CUT THE WIRE OFF THE SPOOL. Take a second bundle and lay it on the twine to cover the stems of the first bundle. I slightly angle this second bundle to the right of the first bundle. Once placed where you want it, take the wire that is still connected to the first bundle and wrap the stems of this second one. By keeping the wire connected you are adding strength to your garland. Next take a third bundle and place it on the twine to cover the stems of the second bundle, but angle it slightly to the left. Wrap the stems with the wire. Continue this alternating process for the length of the garland for a nice full look. Cut and tie off the wire. Once you have completed the greens you can add embellishments or simply leave it as it is. I often add a large bow in the center and pinecones, berries or Dried Citrus throughout as I like a more natural feel. Glass Christmas bobbles or lights can be used to add some sparkle as well. 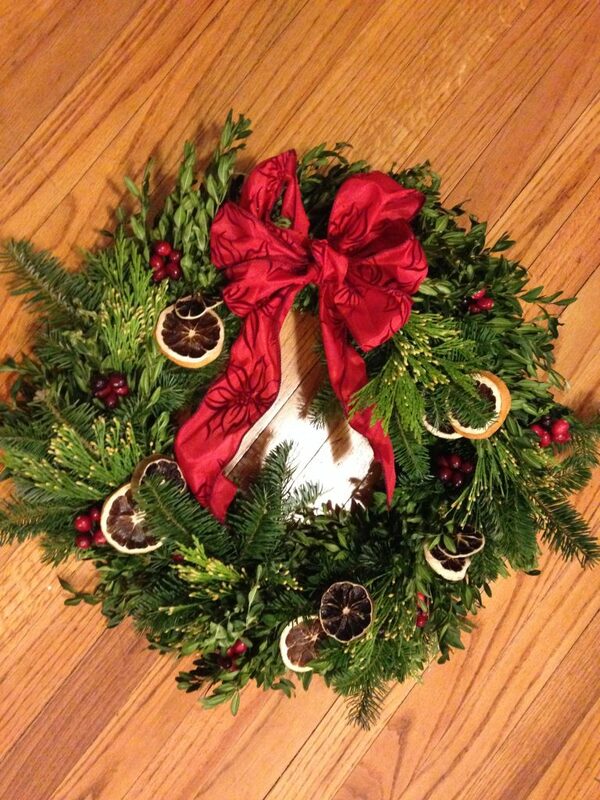 Start by getting or making a metal ring that is the size of the wreath you want. You can either purchase a metal ring at a craft store or make one out of an old metal coat hanger. Next you will need to prepare your greens. 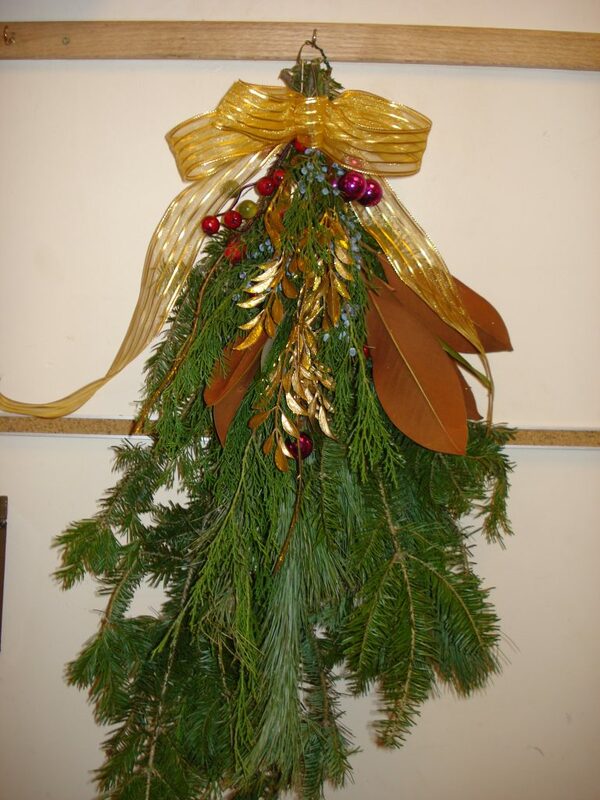 Wreaths can be made out of a variety of mixed evergreens. Once you have decided what you would like to use for greens, cut them into 4 to 6 inch pieces. Make a little bundle with 3-4 pieces of evergreen and tie them to the metal ring. DO NOT CUT THE WIRE. Wreaths are made in the same way as the garland, except you don’t lay your bundles out a long a piece of twine, you lay them around a metal ring. So take your second bundle and lay it over the stems of the first one and wire it on. Continue making little bundles and attaching them to the ring with wire until you have covered the whole ring. Tie off the end of the wire. Decorations such as bows, pinecones and bobbles can be added to provide some interest and to make your wreath more festive. If this process seems a bit daunting, watch this YouTube video to see just how easy making your own wreath can be! Or check out this link for some Non-Traditional Wreaths which will provide unique holiday cheer! Growing up we didn’t always have wreaths for this time of year. My Mom often made a swag/spray for the porch door. These are easy to make and provide just as much holiday cheer in much less the time! You should start by choosing your greens. I usually use a mix of greens for interest such as balsam, white pine and cedar. You will need branches of varying lengths for this project. We will start with the back and move forward. We will be essentially making one large version of the bundles we did for the garland or wreath, with three to four layers. Cut your first two or three pieces to the longest length you want. When making one for the front door, I usually go with 2-2.5 feet. Next add several shorter pieces of either the same type of green or a different one. If you started with 2 foot lengths make this one 18 inches or shorter. Repeat the last step once or twice more decreasing the length of the bough by several inches each time. Tie all the pieces together with wire. Be sure to wrap them extremely tight as you want all pieces to be secure. Make a loop out of wire to hang your swag/spray. Decorations such as bows, twigs and berries can be added as well. Good luck to any of you who try these this year! I hope that this blog post answers any questions about creating your own evergreen holiday decorations. Please let us know if you have any specific questions that you would like answered. We would love to see photos of any of the creations you make. To Share these with us, post them on our facebook page! I hope that you all have a safe and happy holiday season!